As a youngster I dreamed of becoming a professional wildlife photographer. While other kids were reading comic books, I pored over National Geographic Magazines, imagining what is must be like to travel the world to stalk and photograph exotic and dangerous animals. Unfortunately, my career as a sociologist offered little opportunity for stalking and photographing much of anything nonhuman. That is, until sometime around 1995 when I ended up on the dissertation committee of a graduate student from the LSU School of Forestry and Wildlife . His research project involved tracking and mapping the distribution of black bears which were being reintroduced to parts of Louisiana (here is some background). You can imagine my excitement when he asked if Toby (one of our sociology PhD students) and I would like to tag along with him and his assistant while they tracked down one of his GPS-collared research bears somewhere in the woods of New Iberia Parish. Removing the sedated black bear from her den. After trudging through the underbrush on a cold Louisiana morning (you’d better believe Louisiana can get cold), we eventually tracked the bear and her three cubs to a den under the roots of a large oak tree. The team sedated the bear and pulled her out along with her cubs to examine and measure them. The most thrilling part came when the researchers were doing their measurements and other data collecting and Toby and I got to hold the cubs who were not sedated and were small enough to fit in our wool caps. I was stoked! To be that intimate with such magnificent creatures was right up there excitement-wise with getting a paper accepted for publication in a major sociology journal. It was one of the highlights of my academic career. 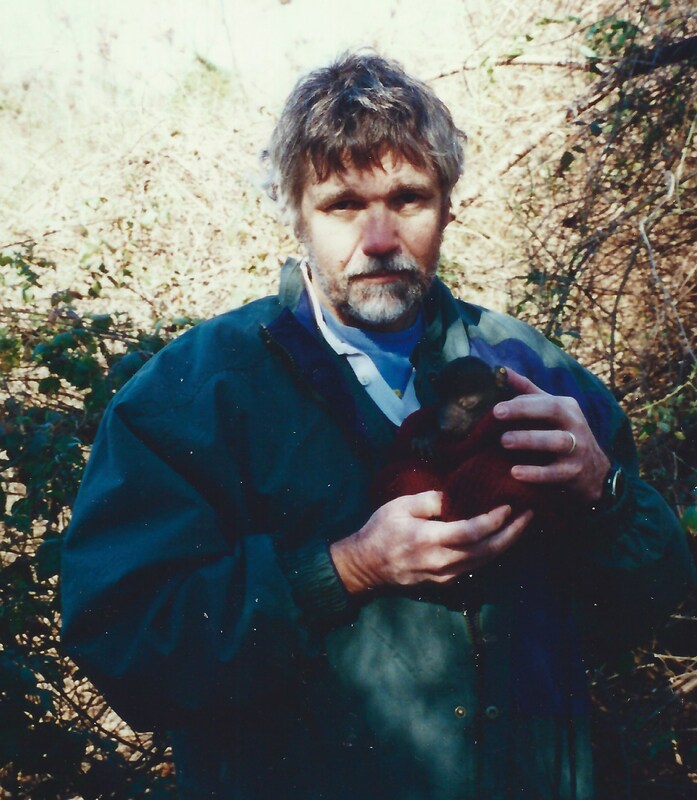 Yours truly holding one of the cubs. 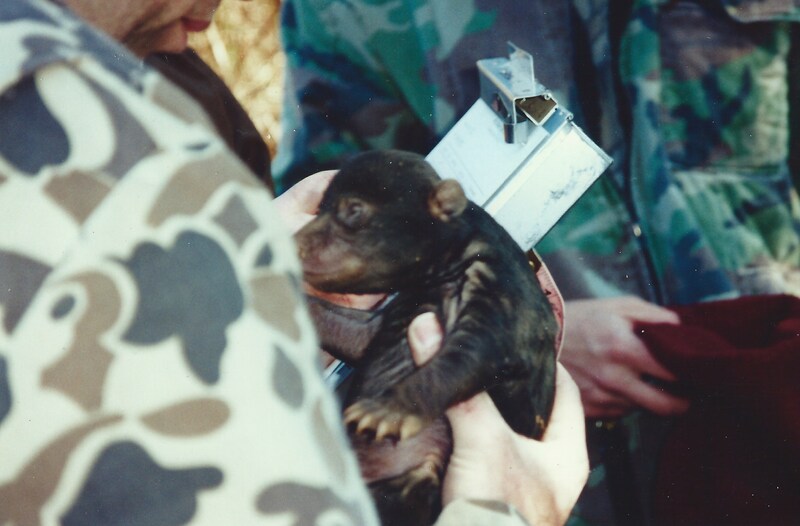 One of the cubs being weighed and measured. It wasn’t until I had retired, moved to Glen Ellen, and became a docent at Bouverie Preserve that I again had the opportunity to become intimate with wild things (see my piece on stalking the ferocious Jerusalem cricket). 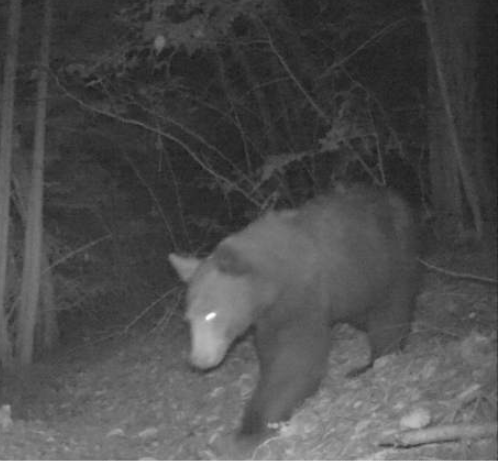 A very cool thing about Bouverie is that numerous trail cameras capture photos of the critters roaming around when humans are not present, mostly at night. The walls of the main building on the preserve (which regrettably was destroyed in the recent wildfires that hit Sonoma County) display (or did display) fantastic photos of, among other things, bobcats, coyotes, mountain lions, and, yes, even a bear (which generated much excitement because bears have not been seen in this area for years). A bear sighting which stirred a lot of excitement. 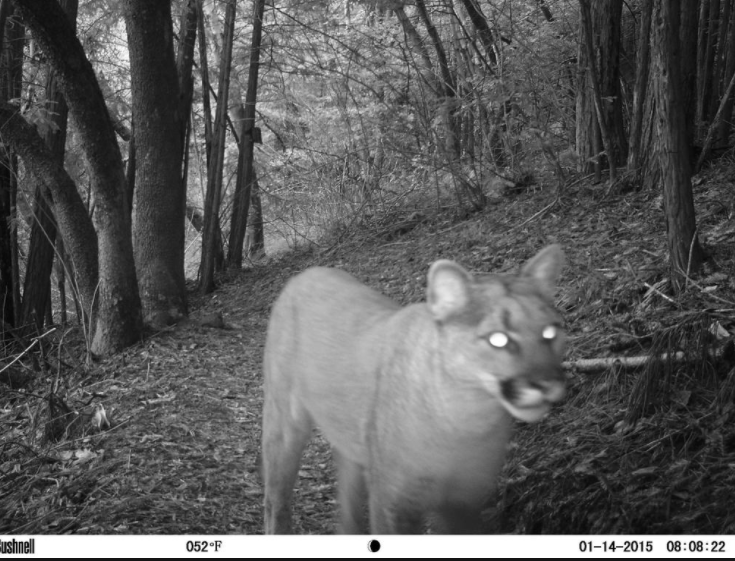 Mountain lion (cougar) on one of the preserve trails. 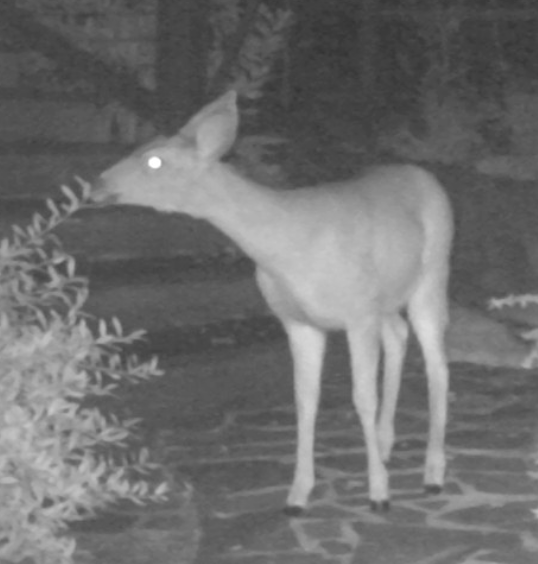 Naturally, this motivated me to buy my own trail camera (aka “stealth cam”) for our home in Glen Ellen, even though we have a small yard. Who knew what creatures lurked outside our house while we are sleeping? 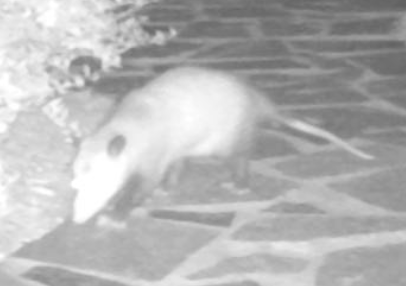 So, almost nightly for the last three years I have been setting up my infrared, motion-activated trail camera in my front yard. I generally set my camera for 11 second video clips, a good size to send in emails – as members of my family are painfully aware. It has become a cherished daily ritual: I position the tripod in late evening and first thing in the morning take out the camera’s SDHC memory card and pop it in my computer hoping for something exciting to appear on the screen. I love starting my day this way. Our front yard – an arena for nightly videos. Ono (our cat) testing my camera angle. The memory card rarely comes up empty. Most nights I capture videos of one or more of our neighbor’s cats (last count they had 9 – one for each life I guess). 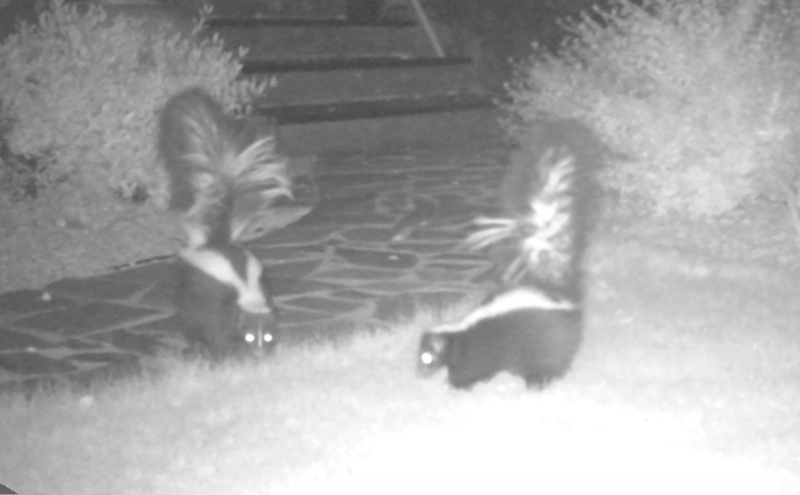 Skunks and raccoons are quite common visitors, as are deer. 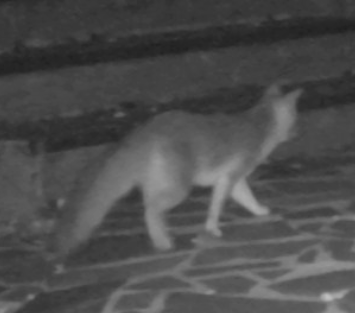 An occasional opossum awkwardly strolls by and on a rare occasions a grey fox makes an appearance. As you can see by the still photos below, the “wild ones” in our front yard hardly have the National Geographic prowess that I dreamed of pursuing when I was a child. However, as our video, Where the Wild Things Are, demonstrates, when the sun goes down it’s SHOW TIME in our front yard . 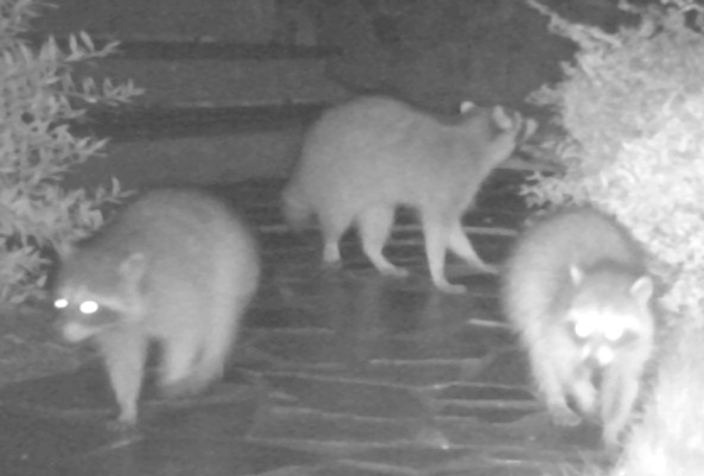 Who knows, maybe one day my stealth cam will capture a bear or mountain lion strolling down my front walkway. I can’t wait until the family gets that video in an email! Post Script: as I was putting the finishing touches on this blog entry our daughter Sara, who lives in San Francisco, sent me a link to a news story about a mountain lion that was tranquilized close to her home. The news article includes this video of what is believed to be the same mountain lion strolling in front of a house earlier. 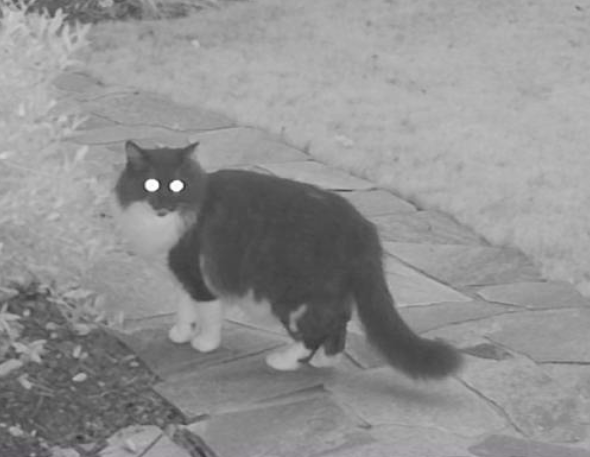 It looks like my dream of emailing her a video of a mountain lion on our front walkway in Glen Ellen has been usurped. Life can be unfair. Post Post Script: It turns out that the video of the mountain lion was taped in front of Mark Benioff’s house. His philanthropic organization donated over $12 million to Bay Area public schools this year. Since our grandsons attend public schools in San Francisco, I feel somewhat better about being usurped. Your pictures are awesome & your dialog even better. Thanks! Even though you are my devoted sister (I won’t say how devoted) I know that your comment is impartial and unbiased.